Yes, the time is here. Autumn is finally upon us and we’re not mad about it. If you’re like us and can’t get enough of the season, then bring the spirit of it indoors. Grab your pumpkin spice latte, wrap yourself in a plaid blanket, and prepare yourself for seven of our favorite ideas to fall-itize your apartment – the renter-friendly way. Any excuse to buy more flowers, right? We love autumn bouquets, from the warm hues to the funky textures. Go classic with bold yellow and orange or mix it up a bit and go with pale shades of pink. Make sure to ask your florist to add in some shades of brown and extra greenery to give it that rustic vibe. Nothing says autumn like a craft project. Pick a nice Sunday afternoon, break out the hot glue gun, and get to work on a DIY fall wreath. Choose something traditional, like faux fall leaves or something more modern like this embroidery hoop wreath. When you’re done, use an over the door wreath hanger or an adhesive wall hook to display it. Want to cozy-up a room in an instant? Candles, candles, candles. Our favorite brand, hands down, is Woodwick. Not only do they have amazing scents, like pumpkin butter and fireside, but their wicks are wooden – hence the name – so it crackles as it burns. So comforting. Prefer something flameless? Wayfair has a ton of options that look like the real deal and even give off yummy scents. Let’s be honest, string lights can be used all year round, but we love them and had to include it on the list. Set the ambiance by hanging some across your living room or grab a mason jar and fill it with fairy lights to create a unique, glowing accent. When you’re finished, turn off the lights, snuggle up, and enjoy! 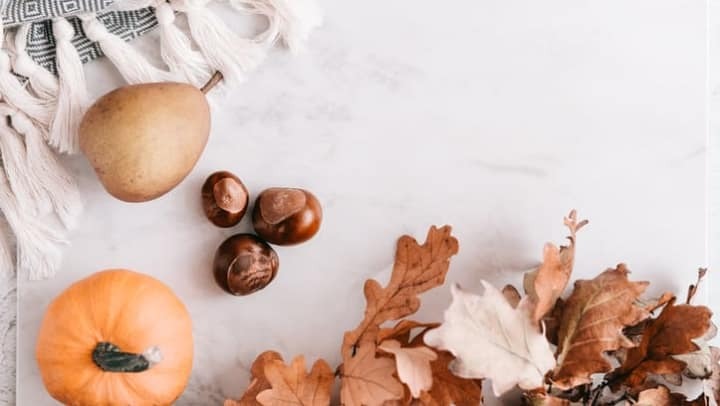 If you can't get enough of all the autumn scents, take it to the next level with homemade potpourri. Gently burn some of your favorite smells on the stovetop all day long or create your own dried version. Use things like cinnamon sticks, vanilla essential oils, nutmeg, fresh rosemary, lemon – whatever tickles your fall fancy! Let’s think outside the pumpkin for a second – literally. Put a twist on the traditional pumpkin carving and try spray painting them instead. First, find some old newspaper or cardboard boxes to set up your painting station outside. Take a few pumpkins and get to work. Go glittery, shiny, metallic, or colorful, whatever gets you in the fall spirit. Let them dry for a few hours and place them next to your front door or bring them inside for a cute table centerpiece. No fireplace? No Problem. You can still get all of the feels with this little life hack. Pull up YouTube on your computer or TV and play a crackling fireplace on loop. It may sound silly, but it’s a simple way to bring all the cozy vibes together. This video gives you eight full hours of fire crackling delight! All you need is a cup of ginger tea and a good book to get lost in and you’re set! Looking for more ideas and tips for your apartment? Check out the Delray Station blog.